Covering presidential politics from the inauguration of George Washington on lower Manhattan's Wall Street, to the current volatile and unpredictable campaign, Campaigning for President features selections from the nation's largest and most comprehensive collection of campaign artifacts along with objects from the Museum's collection. 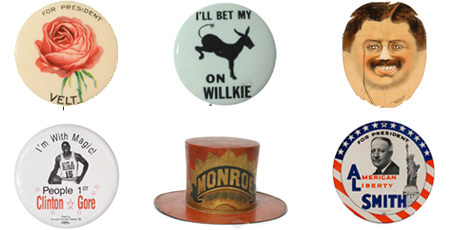 Highly expressive buttons, banners, posters, hats, dresses, and other artifacts on view highlight the role of visual propaganda in the electoral process. Collectively they reveal the underpinnings of today's mass-media campaigns, demonstrating that U. S. politics has for centuries been characterized by sloganeering, promissory mantra-making, and abundant, often gleefully vicious mud-slinging, which prevails from the 19th century through today. Campaigning for President highlights New York's strong impact on presidential elections in terms of the popular vote, the electoral college vote, and the selection of candidates. "the democratic spirit in its most uncensored, insistent and excited moments, at the brink of selecting its national leaders." For more information visit Campaigning for President online. MUG readers: Tickets are $5 each when you mention MUG. Call (212) 534-1672, ext. 3395. Reservations are required. What's more revealing than a stump speech, more insightful than a debate, and more brazen than a bus-load of campaign reporters? The American Political Cartoon. Join Marty Goldensohn, producer of Brian Lehrer Live; award-winning cartoonists Matt Davies, Jimmy Margulies, and Ted Rall; and author Donald Dewey for a discussion on the mischievous art of political cartoons. Once considered underdogs, Senators Barack Obama and John McCain have defied the odds to win their party's presidential nominations. Errol Louis, columnist at the New York Daily News, will discuss this year's historic primary season with Hank Sheinkopf, political campaign consultant; Ricki Lieberman, of Senator Clinton's presidential campaign; and Joyce Johnson, of the Obama campaign. Theodore C. Sorensen, former special counsel and adviser to President John F. Kennedy and author of the New York Times bestseller Counselor: A Life at the Edge of History, will talk about his life, political experience, and working for JFK with Nicholas Lemann, Dean and Henry Luce Professor at the Columbia School of Journalism. Will 2008 finally be the year when the youth vote decides the presidency? Join leading hip-hop activists, scholars, and artists in a town hall style discussion of the impact of the hip-hop generation on the election and how hip-hop has morphed into a potent political force. Free; reservations required. Advise and Consent, directed by legendary filmmaker Otto Preminger, is widely regarded as one of the greatest films about the American political process. Foster Hirsch, professor of film at Brooklyn College and the author of 16 books including Otto Preminger: The Man Who Would Be King, will introduce the film and discuss Preminger's importance as a director. Free with Museum admission.